It was a bit of an odd surf weekend. There were waves. Kind of. There was still a bit of size to it but you could tell that the swell was definitely on its last legs. There was not much power behind it at all. We were still hoping to get some good surf in on Saturday and were headed to our beloved Curl Curl. Unfortunately, Curly which rarely lets us down lately, did not look too exciting. Yes there was a semi clean wave but upon closer inspection it looked like it was fizzling out straight after breaking with no wall to it. So we checked Dee Why instead. Dee Why looked pretty good. About 3ft clean and some of the sets we saw seemed to wall up nicely. So we ended up surfing Dee Why even though I’m not necessarily a big fan of it. And I must have jinxed it, surely by the time, we got in, it was pretty bad. It was very inconsistent and I managed to be at the wrong spot all the time. There was no decent set coming through for ages. When I paddled further to the inside, of course, the set of the day would come through leaving me only to duck dive with no real chance to catch a wave. Usually, I’m quite good at sitting in the right spot but it was just one of these days were I was just a bit off. Maybe it’s because I don’t like Dee Why. I always feel a bit like a stranger there. I never had a great surf there unlike at other spots on the Northern Beaches.I always feel like home in Curly or Bungan for example and usually have good surfs. 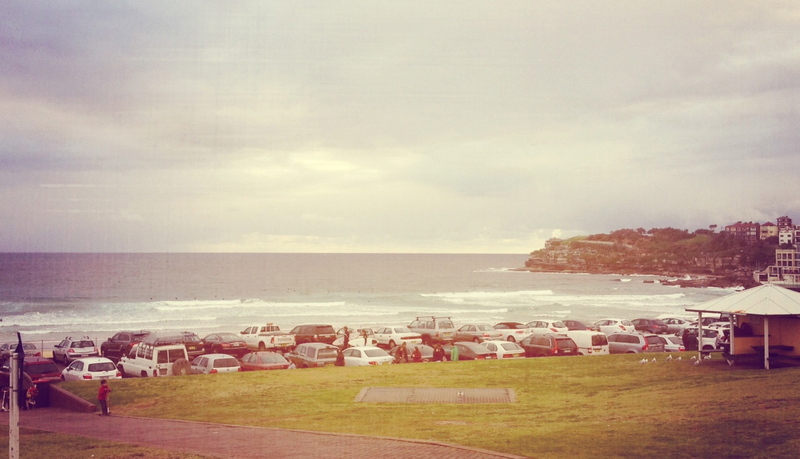 On Sunday, the swell was meant to drop further so we did not bother driving anywhere and stayed in Bondi. I had a great surf in the morning. It was early and not too crowded. 2ft semi clean waves and some good mates in the water made for a fun surf. The banks where ok too and I took the right board with the fish which made up for the lack of push in the waves. It was so much fun that I had high hopes for the afternoon surf. Now, I find it really hard to go for two surfs in winter because it usually takes me all day to unfreeze from the morning surf. But then the surf forecast for the upcoming week looks rather dire and I decided to make the most out of it today. It was not the best idea I’ve ever had though. I did catch some ok waves. It was very rippy though and like the day before, I spent most of the time paddling trying to stay in the right spot. The other weird thing was that I did not know one single person. No one. Usually, there are at least a couple of my mates out there. Boring. It made me feel like a stranger on my ‘own’ beach’. Oh well, I’m not complaining. I had a good run in the last few weeks and guess who’s looking forward to an even better run of waves in Indo soon.